Add some more submenus to this mod? "SP Outfits Saving"
Since I don't have Visual Studio and I'm bad at programming, could anyone do it for me / for us, or tell me how to do it? Also, you can see those < > symbols on the right. Is it possible to make it work like that? The user could switch between ON/OFF using num 4 and num 6. If it's not possible, it should just be a button. Num 5 to activate and num 5 again to deactivate. 3.) 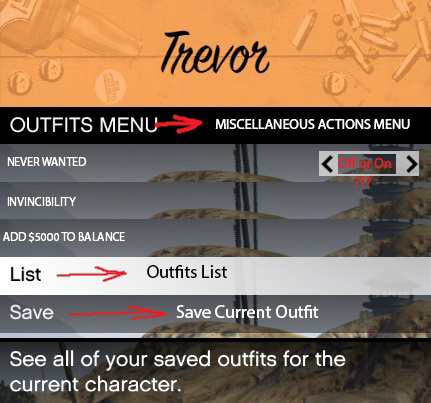 Change "List" text to "Outfits List"
4.) Change "save" text to "Save Current Outfit"
Also, how do I compile it when done coding? I must download visual studio? And it's a single .dll file originally. I don't know how to create .dll files. Please close this because I did this mod myself, no longer needed.